Cisco certification 642-887 exam tests the knowledge of the concepts and implementation of MPLS technology and MPLS-TE services of candidates. It is one of the four exams for CCNP Service Provider certification. 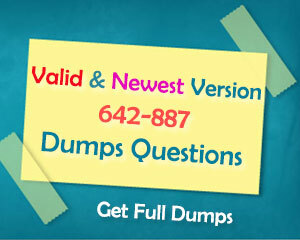 Here recommend you to prepare for 642-887 exam with real dumps. Valid 642-887 exam dumps will ensure that you can pass SPCORE 642-887 exam at the first try. 1. An LDP session is established between two neighbors. Over which protocol and port number do they maintain their adjacency? 2. Which option describes what happens when a labelled packet with a TTL of 1 is received by an LSR? 3. Which protocol is used to send MPLS OAM traffic over an MPLS network? 5. Referring to the Cisco IOS XR show command output exhibit. XR2 needs to have LDP configured with PE1. Which configuration achieves this goal? 8. An engineer is working in a service provider environment to troubleshoot a MPLS VPN. The engineer determines that LDP neighborship is flapping between two routers and causing disruption to the traffic. 9. Which configuration can a network engineer use to establish high availability for LDP in an MPLS setup? 10. Which configuration fulfills the requirement of configuring LDP with Cisco Nonstop Forwarding on a router with 5 minutes time to hold the forwarding table information and 1 minute retry timer value for an LDP connection? 12. A network engineer must design a core network routing domain that supports Cisco MPLS TE. 13. The network architecture team is proposing to enable Cisco MPLS TE over the entire service provider core network. 15. A network engineer must analyze RSVP-TE signaling on a syslog server. 16. An engineer is tasked to deploy Fast Reroute for Cisco MPLS TE. Which LSR is in charge to request the Fast Reroute capability along the LSP? 17. The regional operation center deploys a Cisco MPLS TE tunnel over the company’s core network. The Cisco MPLS TE tunnel is up and no error is detected, but no traffic is traversing the tunnel. 18. Cisco MPLS TE tunnels recently have been deployed to minimize the utilization of a congested link in the core network. The tunnels are up and the administrative weight is correctly configured, but no improvement has occurred since they went into production. Which IOS command can be used to modify Cisco MPLS TE path selection on an interface? Which option lists the equivalent configurations required on a Cisco IOS XR router? 20. A company asks an engineer to provide an explanation for implementing MPLS DiffServ-TE services. Which option is a DiffServ-TE fundamental concept that should be highlighted?